Welcome to this week's Finance Fridays. Last week we were talking about guarantor loans and what you would need to know if you took one out or if you agreed to be the guarantor. For this week we've turned to the high street. Sadly another two famous stores have fallen into administration this week. Here we have a look at some of the shops which are now retail history and the changing shopping patterns of the 21st century. BHS – The first UK branch opened in 1928 in Brixton, South London. 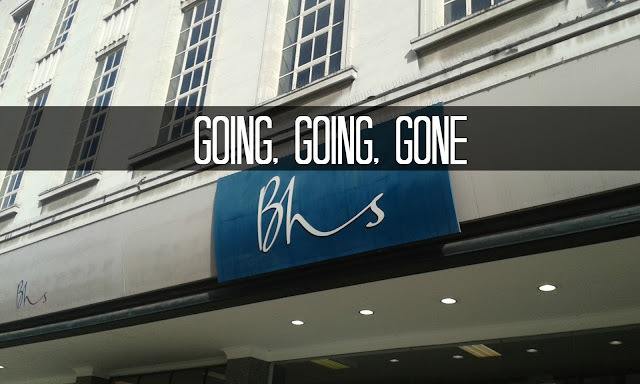 Until 1986 it was known as British Home Stores when it rebranded as simply BHS. In my opinion I think the stores looked tired and unfashionable. The children's clothes were expensive compared to other shops whose name carried more cachet to them. I can't remember the last time I ever bought an item of clothing for myself in BHS as they don't sell my size! I did pop in at Christmas time to buy some new underwear for Master JibberJabber as I had forgotten to pack some for him. I had the choice of Marks and Spencer or BHS and I figured BHS would be a lot quieter. I think that says it all. Austin Reed – The upmarket clothes retailer has continued to struggle over the years and went into administration on Tuesday. The flagship store on Regent Street was closed in 2011 and last year 31 shops were shut. Its customer base fell between those who shopped at M&S and John Lewis and the ones who could afford full-on designer. Over the years it was always going to be a tricky niche to fit into especially since it never captured the market of the disposable income rich 20-somethings. Woolworths – The demise of Woolworths shocked many people but it was a long time coming. Over the years we all probably nipped in to buy some kitchenwares, confectionery from the famous 'Pick n Mix' or stocked up on some stationery. My daughter had plenty of items from its Ladybird clothing range. How Woolworths really made its money was through its music sales. At one point it had its own record label and until the 1990s it was the UK's number one music retailer. As music sales declined so did Woolworths. It struggled through 2008 before finally closing all its doors in January 2009. Many people mourned the loss of Woolworths on the high street until they realised they could buy everything apart from the clothing and entertainment items from the ever-expanding Wilkinson stores. The Woolworths name was bought in order for it to be used online but by 2015 it ceased to exist at all as a retail business. Our Price/Virgin Megastore – Video may have killed the radio star in the 1970s but in the noughties it was the internet that killed the music shop. The Our Price and Virgin Music stores were brought together when WH Smith bought them separately and then sold them off 1998. Our Price was known for its small shops while Virgin Music had its multi-floored megastores. This combination didn't stop the decline in sales. As a last grasp it rebranded as Zavvi but it didn't work and the final stores closed in 2009. It fell victim not only to online retailers such as Amazon and Play but also because customers were starting to download or stream music. C&A – As a child and teenager most of my wardrobe came from Dutch brand C&A. Indeed I still only have one belt and it was the one I bought from C&A when I was 17! Although C&A is still successful throughout Europe it decided to close its doors in the UK in 2001. I remember at one stage Oxford Street in London boasted of three C&A shops. One thing that always baffled me was why did they sell so much ski wear? Have you shopped recently in BHS or Austin Reed? What high street shops do you miss? If you want to join in with this week's Finance Fridays then add your link to the linky below. Any post concerning financial matters is allowed. Full details here. It doesn't have to be published today as you have until 23.55 on Tuesday 3rd May 2016 to join in. Grab my badge below for your blog post. Wow, I haven't seen the news this week and didn't hear about the latest closures. I'm not surprised though, BHS has been quiet in our town for years. Retailers need to embrace the changing world and way customers are buying now - adapt or die unfortunately. That was a very interesting read. I used to love going round Woolies with my mum when I was younger. It was a treat to be able to have a pick n mix! I miss all the ones that have gone, especially Woolworths but to be honest I did hardly go into them....that's the problem of course!